We are pleased to share that our application NDMC-311 got featured on Jagran, a leading newspaper of Delhi, of 12th March 2016 edition. 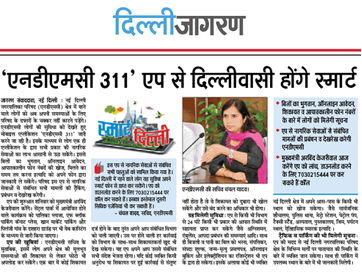 The NDMC-311 application launched for the citizens of the city, allowing them to access enormous civic services like helpline24, make power and water bill payments, apply online for licenses, certificates or booking of community halls and report any civic issue like water logging, malfunctioning streetlights, and damaged footpaths, dustbins, etc. Delhi citizens can get huge help and make their daily life a lot easier by using this application.